Please check out my follow-up article on the ongoing politics of land reforms in Kazakhstan at The Diplomat, here. 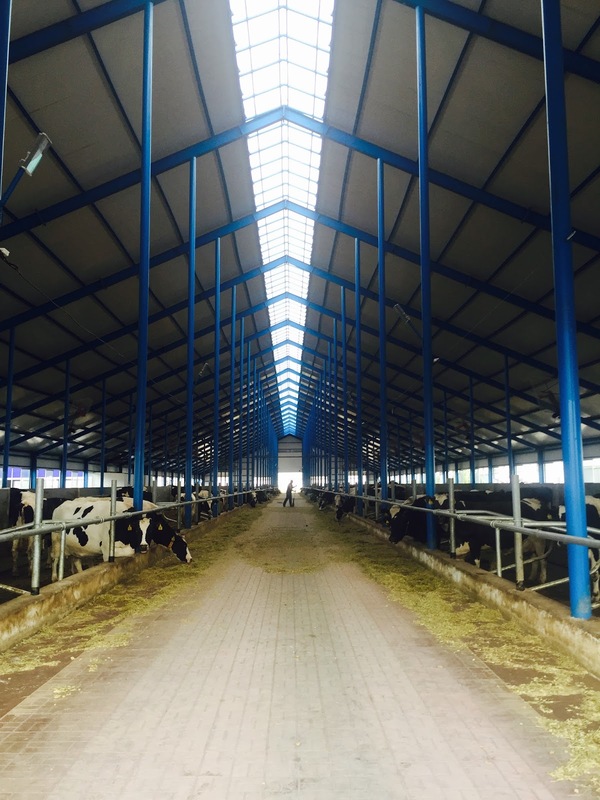 With some understanding of the political sensitivity of land reform and the predominance of agriculture in Kazakhstan’s economy, let us rehash more recent political events in Kazakhstan. There have been a lot of articles on the April and May protests, but I in this post, I would like to try and gain a better understanding as to why the protests came about as well as the government’s response. The law on amendments and changes to the land code was adopted by the previous session of the Mazhilis in November 2015. Given the closed-doors tradition of lawmaking in Kazakhstan, while there may have been an announcement that the bill was adopted in November, there was virtually no public discussion about the bill’s contents. Industry insiders were probably familiar with the bill, but it certainly was not widely discussed in the media. Plus, the topic of land reform did not appear in any of the pre-election platforms of the seven parties, safe for the Ayul party, which is an agrarian party. Though, agricultural reform is an ongoing discussion in the context of economic diversification and development. This recent bill on amendments to the land code resurfaced at a press conference on the implementation of the 100 steps program on March 30, 2016 in Astana, when then Minister of Economy Erbolat Dossayev stated that beginning July 1, 2016, local land bodies will organize auctions to sell 1.7 million hectares of land. 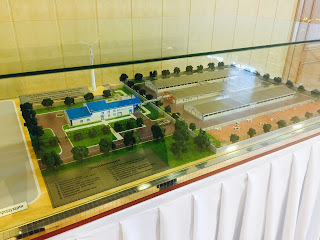 Dossayev added that of the 1.7 million hectares, already 645.4 thousand hectares, representing 1,271 plots, had already been prepared for the auctions. Dossayev’s comments marked the first time this particular bill, and auctions were discussed in public. The dearth of information about the exact wording of the legislation, the lack of transparency in the law-making process and the absence of public discussions aggravated many Kazakhs and led to the propagation of misinformation. Many in Kazakhstan claimed that the bill would grant foreigners the right to purchase agricultural land. However, as I have already discussed in previous posts, this is simply not true. The proposed bill extends the maximum term of a lease for agricultural lands from 10 years to 25 years. Dossayev’s announcement came at an already tenuous time in Kazakhstan’s development history, which largely fueled public response. The move to free-float the tenge in August 2015 caused the value of the currency to fall from 185 tenge/dollar to over 350 tenge/dollar in January 2016; the tenge is currently hovering around 337 tenge/dollar. Meanwhile, the fall in oil prices forced the government to rebalance its budget based on a benchmark of $35/barrel, rather than $80/barrel. Oil-related revenues from production and transportation subsequently fell. Moreover, Kazakhstan has suffered from the slowdown in the Russian economy and Russian counter-sanctions. 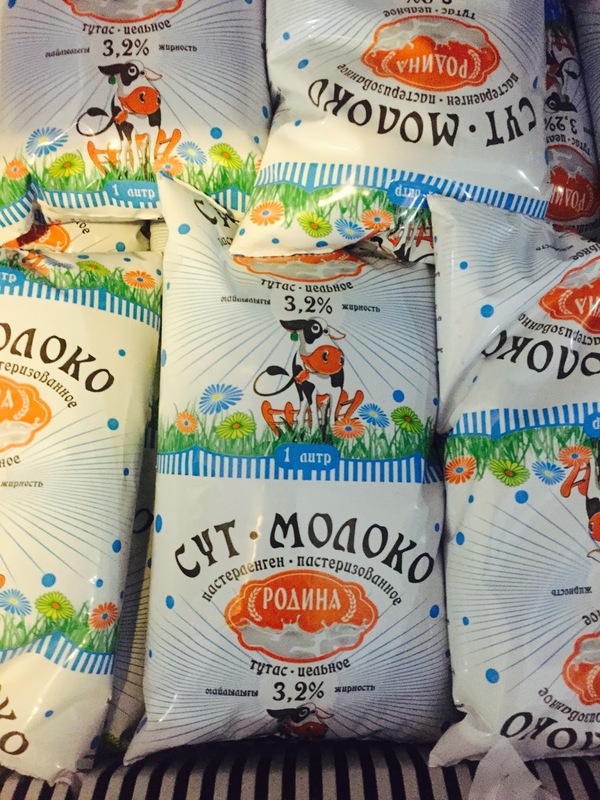 According to my discussions with local businessmen, there have been several instances when Kazakhstani enterprises have been unable to import goods from Europe, as Russian customs officials prohibited the transit of such goods that supposedly violated Russian countersanctions. But there are other issues that exacerbated the strain of an already difficult economic environment. According to one social activist, in developing the left bank of Astana, several families who inhabited small dachas were forced to evacuate their homes to make way for future development. While these families lived in the dacha homes year round, they received compensation for a dacha plot, rather than that for a single-family home, leaving affected individuals homeless and disgruntled. In other instances, budgetary shortfalls and redrawing of districts forced many schools to close. In Kostanay oblast, for example, either schools were closed in 2014, and in 9M 2015, another nine schools were forced to shut down. 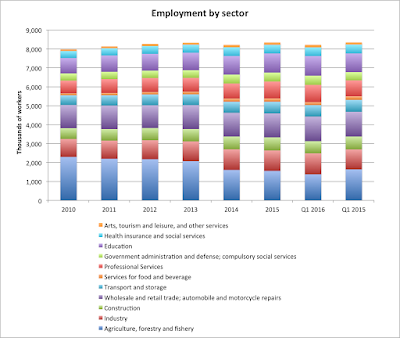 According to the Agency of Statistics, the number of primary schools throughout the country fell from 7,755 in 2010, to 7,562 in 2014, and 7,511 in 2015. That said, school closures could be caused by a multitude of reasons, not all of which are negative. Plus, displacement of residences occurs around the world, and is an inevitable consequence of municipal development. 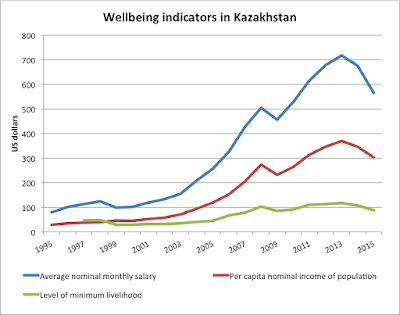 As demonstrated in the figure “Wellbeing indicators in Kazakhstan”, in dollar terms, the average nominal monthly salary, per capita nominal income of the population, and state-determined minimum level of income to survive, all grew between 1995 and 2007, contracted in 2008-2010 due to the global economic recession and December 2008 take-over of banks (that lead to the February 2009 devaluation of the tenge), and then experienced moderate growth through 2013 when global oil prices grew astoundingly. However, since 2013, all three indicators have contracted. 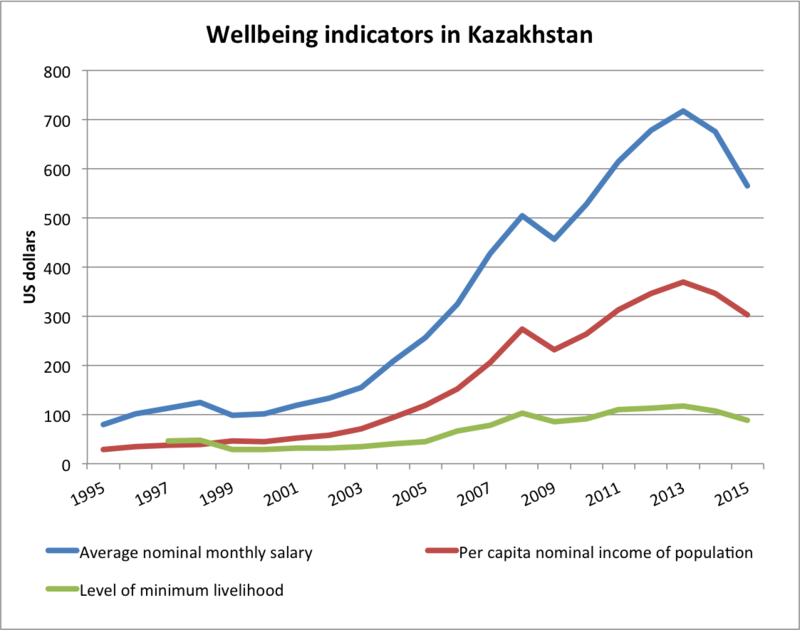 But given the structure of Kazakhstan’s economy, this is natural. Kazakhstan is also one of several economies in the region that has experienced this pattern of growth, the others being Azerbaijan, Russia and to an extent, Uzbekistan (though Uzbekistan’s volatile currency had its own “formal” and “informal” exchange rate). Given these developments, according to Battalova, Dossayev’s seemingly last-minute announcement of the land reforms, and the lack of communication as to their precise stipulations, represented “the last straw” that prompted people to gather on the streets. Land reform proved to be the outlet for expression of frustration with the general economic environment. Though, not a single protester advocated for political transformation. Meetings took place in various cities across Kazakhstan in April, including non-rural regions such as Atyrau, Aktau, Almaty and Astana. 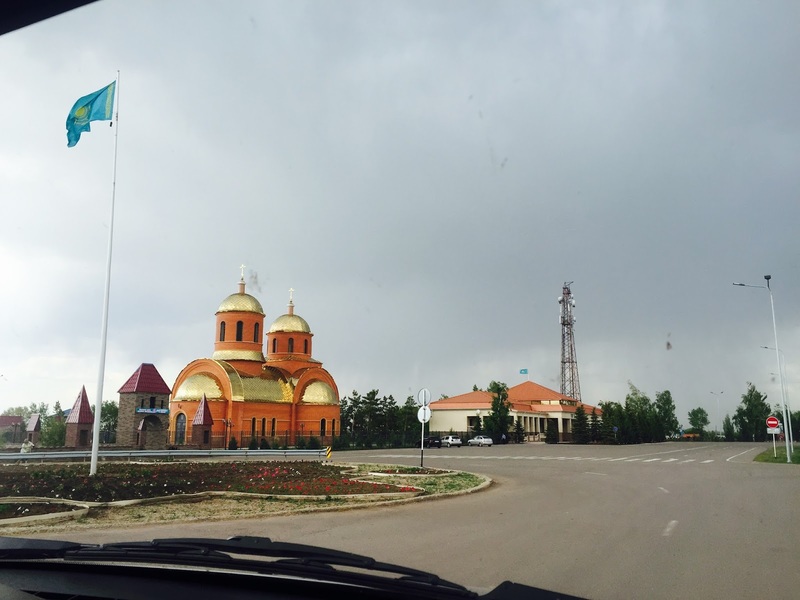 There were some meetings in Kyzlorda, but there were no reports of meetings in ayuls. These were by and large peaceful protests, as there were neither reports of civilian injuries nor casualties. It is also important to note that there was no Zhanaozen-level clash between police and civilians. That said, several individuals who participated in the April and May 21st meetings were arrested, and many have since been released. On June 3, authorities in Astana released Aslan Kurmanbayev and Kurmangazi Rakhmetov, and in Semey (Semipalatinsk), Marlan Esil’bayev. In response to the protests that erupted in April, President Nazarbayev moved to impose a moratorium on the land reform. On May 5, Nazarbayev issued an edict for the formation of the 75-person Commission on land reform. Members of the Commission include representatives of industry, farmers, former and current politicians and social activists, including opposition figure Mukhtar Taizhan. One notable opposition figure that was invited, but ultimately refused to participate in the Commission, was Zauresh Battalova. Over tea, Zauresh explained her reasoning. First, she had insisted that the Commission work on a consensus only basis. This idea was rejected and the Commission works based on majority vote. Second, she had insisted that all 55 journalists who had been arrested be released as a precondition to the first meeting of the Commission. Third, she wanted to increase the membership of the commission to include more members from civil society and the agrarian sector. But this last idea was seen as unfeasible, and would cripple the Commission’s efficacy (understandably). Having met with Zauresh and other members of the opposition, as well as government officials, it is critical to understand that neither Zauresh nor other opposition groups seek to violate the laws or instigate widespread social unrest. “I was a senator for two terms (1998-2005), why would I want to break the law,” she emphasized. In the past, when permits for a meeting were not granted, Zauresh took caution to ensure that she did not organize a meeting, but opted for a round table or expert council on private property instead. Ultimately, the opposition and those in government want the same thing – a stable, prosperous and opportunity-rich Kazakhstan – they just need to find a way to work together. But that’s politics. The Commission operates directly under the office of the President, as Bakhytzhan Sagintayev, a top official in the Ak Orda, serves as the Commission’s chairman. The Commission is tasked with the responsibility of drafting a new bill on land reform that will ultimately be submitted to the Mazhilis. After reviewing the bill, the Mazhilis will pass it and submit it to the President to sign into law. The Commission is set to exist through December 31, 2016, coinciding with the duration of the moratorium. As part of the bill-writing process, Commission members will travel around the country and discuss proposed changes with local businesses and politicians. Already after three meetings, members of the Commission agreed that they were ready to meet with local communities and gather their insights on land reform. The driving goal behind the Commission is to provide a bridge between the Ak Orda, Mazhilis and the people of Kazakhstan. 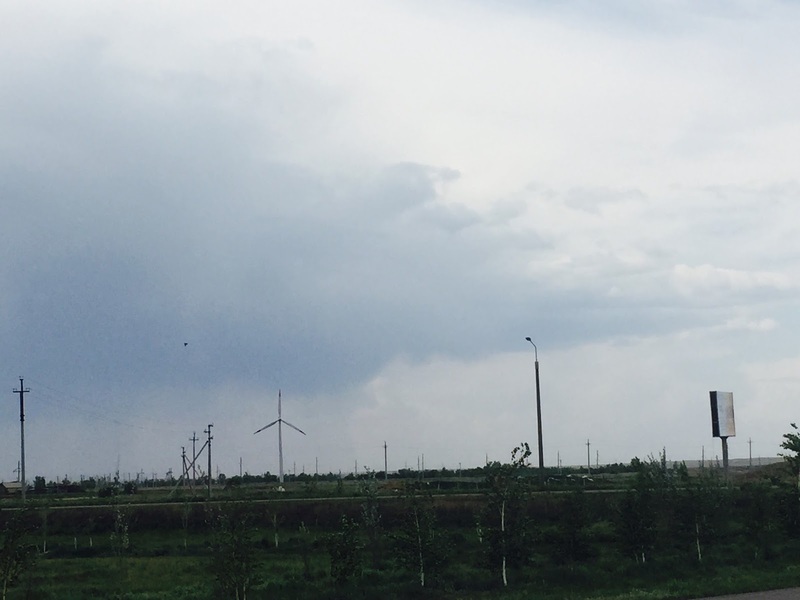 This past week, Sagintayev was in Kokshetau. News reports of the meeting showed a fairly interesting and lively conversation between Sagintayev and local agro-businessmen. According to reports Kazakh media covering the meetings, the questions were mainly focused on the terms of leasing versus purchasing land for Kazakhs. 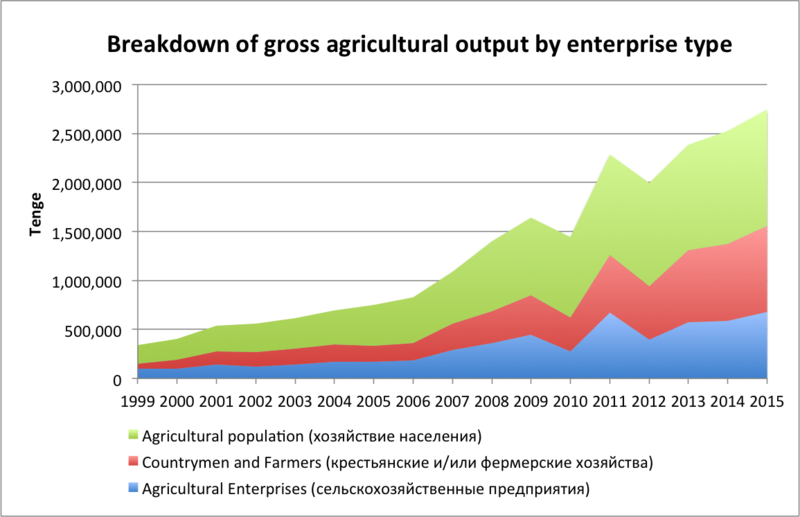 As already discussed, nearly 99% of agricultural land in Kazakhstan is leased. At one point, there was discussion of eliminating the ability of farmers to lease the land and increase individual ownership, but this clause has since been redacted, as leasing arrangements are important to allow for experimentation, and also because most farmers simply do not have the capital to purchase land. Some farmers proposed increased formation of cooperatives, others insisted on maintaining the current 10-year lease restriction for foreigners, and some argued that the ten years should remain, but there should be an option to extend the lease if the cooperation between the foreign company and local enterprise leads to a successful outcome. Interestingly, these proposals echo, if not exactly mirror, the ideas expressed by members of the Commission. The Commission first met on Saturday, May 14, from 10 AM to almost 5 PM. The second meeting of the land commission on May 21 lasted from 10 AM to 7 PM and coincided with the meetings (not really a coincidence). The third meeting of the commission on Saturday, May 28 only lasted from 10 AM to 2 PM, and nearly 30 of the 75 members on the Commission spoke. All Commission meetings are broadcasted on television. On one hand, the public broadcasting of the Commission proceedings is a positive step in terms of transparency. The public broadcasting of the Commission meetings is not only extremely entertaining for political science junkies like myself, but it is also a wonderful way to gain insights into the arguments made by some of the country’s most senior officials. We so rarely get to hear these voices. The government also created a website to update the public on land reform. On the other hand, over tea, a former official raised the question, why was the decision made to form an independent Commission on land reform instead of hand the topic to the Mazhilis? After all, the Mazhilis was elected in March 2016 and its Constitutional responsibility is to write and approve laws. This could have potentially been an opportunity for the members of the Mazhilis to enhance the institutional legitimacy of the legislature by being on the frontlines of the government response to a major dispute. Since land reform is a long-term issue, it could have been constructive to assign the Mazhilis, a permanent institution, with the responsibility of solving the issue, rather than delegating this to the Commission that is slated to disband by the end of the year. When I asked members of the Commission as to why the Mazhilis was not directly involved, I was told that a Commission would be more inclusive and allow for greater civilian outreach. The Commission brings together individuals with a range of experiences and is therefore better qualified to tackle an issue as complicated as land reform. Plus, many of the members of the Commission formerly served in the Mazhilis. As a follow up, I asked some Commission members how they plan to work with the Mazhilis in the fall, and what would happen if the Mazhilis rejects the proposed bill. All three Commission members I spoke with indicated that there was no exact plan yet, but that they did not anticipate an issue and fully expected that the Mazhilis would pass the bill without major qualms. Though, they noted that in the fall, the Commission and members of the Mazhilis would likely engage in a constructive dialogue. The other challenge facing the Commission is that it has an extremely ambitious reform agenda. Land reform is a complex, systematic issue that will not be solved in six months or even one year. Drafting and ultimately implementing amendments to the land code requires meticulous coordination between multiple government agencies in Astana and in the regions. While the Commission is divided into four working groups that meet during the week – economics, communication and mass media, law and implementation – there is still such a wide range of complex topics that it will be challenging to coordinate policy formation, project implementation and monitoring. Just to show the scope of topics discussed in the context of land reform – at Saturday’s Commission meeting, members all emphasized the need for technology (a buzz word), but offered different notions as to the terms for foreign companies to bring such technology on leased land. One Commission member argued that foreign companies leasing agricultural land should have limits on the amount of visas available for foreign employees, or that companies can bring their own workers to train Kazakhs, but that this training period be limited to six months (fortunately this comment was ignored since training takes more than 6 months, especially in a cyclical sector like agriculture, but the idea could very well resurface). There were also important topics that were not discussed at Saturday’s Commission meeting. For example, agricultural land is still appraised (valued) according to the old, Soviet method, but there are discussions within members of the agricultural professional community of the need to introduce a new valuation code that takes into account infrastructure development and soil quality. The Soviet method assigns a value to a certain area of land, and is less flexible with respect to fluctuations in the market, according to one official. Perhaps this was discussed offline among members of the economics sub-Commission, but as demonstrated by the recent wave of protests, it is important to at least discuss this in public. Having observed a meeting of the Commission, read about previous Commission meeting and interviewed officials, it appears that there are a lot of very difficult but important questions being introduced and discussed. But there are more questions raised than answers given, which is a natural part of the legislative process. Such questions should be debated and researched at length, with the ultimate result being a written bill available for public viewing and commenting. So far, members have engaged in constructive debates, but it is 4 weeks in, and there is six months left to the year. Solving a complex issue like land reform is a long-term process that requires the participation of multiple government organs, continued communication with the public and constant engagement by legislators. The Commission on land reform was formed to complete all of these activities, as well as fulfill an extremely ambitious, well-intentioned reform agenda. 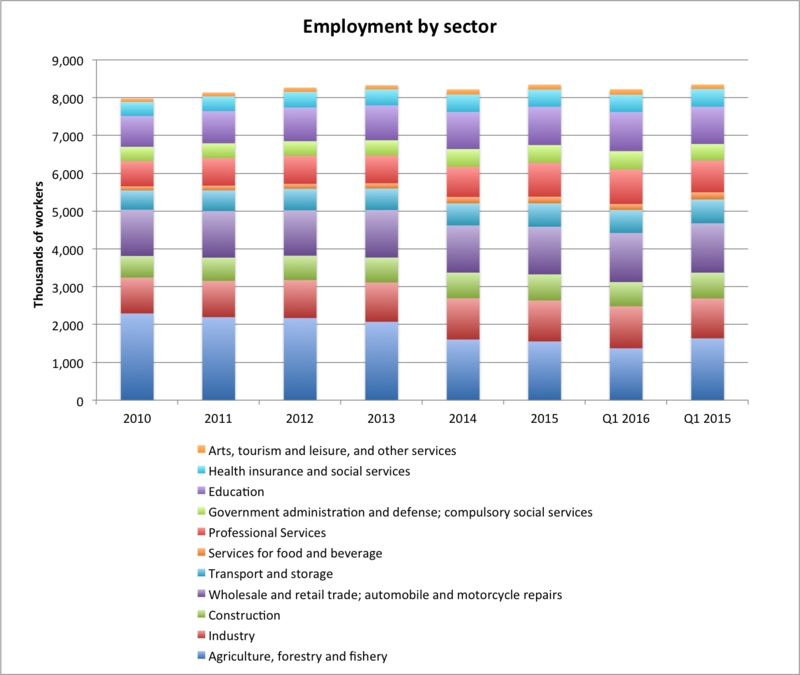 The current economic environment makes this all quite challenging, but it will be interesting to observe the Commission progresses over the coming months. In 1980, Kyrgyz-Soviet writer Chingiz Aitmatov (1928-2008) published The Day Lasts More than a Hundred Years. The novel opens with Ukubula informing her husband Burannyi Yedigei, a railman in Kyrgyzstan, of the death of their elderly neighbor Kazangap, who died alone in his home. Out of respect for the beloved Kazangap, Burannyi Yedigei organizes a traditional, Kazakh burial “with full honor” (p.25). As Burannyi Yedigei prepares for the burial, reaching out to Kazangap’s son, acquiring a two-humped Bactrian camel and planning the journey from the Boranly-Burannyi railway junction, across the Sarozek desert, to the Naiman tribe’s cemetery of Ana-Beiit, he is forced to redirect his route relative to the Soviet railway that transverses the steppe, disrupting the traditional path. As Buryanni Yedigei encounters different characters, the intransigence of traditional, nomadic norms and their clash with modern, Soviet institutions emerges as a central theme in the story. Each chapter opens with a few lines of poetry (below), reinforcing the notion that Soviet industrialization of the steppe disrupted traditional nomadic routes and impeded on sacred spaces. Trains in these parts went from East to West, and from West to East. On either side of the railway lines in these parts lay the great wide spaces of the desert – Sary-Ozeki, the Middle lands of the yellow steppes. In these parts any distance was measured in relation to the railway, as if from the Greenwich meridian. And the trains went from East to West, and from West to East. Appalled, Burannyi Yedigei, insists, “I’ll pray. I will lay out the dead man. I’ll say prayers.” The dialogue continues. In many respects, Burannyi Yeidgei’s journey in The Day Lasts More than a Hundred Years and his devotion to traditional, nomadic ideology is a metaphor for understanding the political, social and cultural sensitivities surrounding contemporary land reform in Kazakhstan. As a historically nomadic people, Kazakhs retain a very intimate relationship with land. 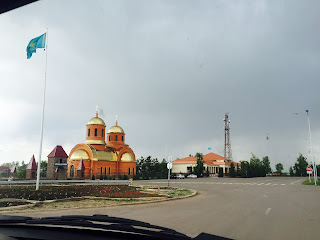 There is a Kazakh saying, “land is mother, and you do not rent your mother.” There is also the idea of “Atameken” which means land of forefathers/ancestors (ata is Kazakh for father, and meken is Kazakh for place of living or being). Today, Kazakhstan’s national palace of entrepreneurs – the major organization that includes all legally registered businesses – also bears the name Atameken. “We Kazakhs fought for our land against the Zhungars [and other tribes]…think of all of the blood shed, all the warriors who died,” Kenzhegali Sagadiyev affirmed in an interview. Having fought centuries for control over the territory of contemporary Kazakhstan, Kazakhs understandably feel a sense of defensive, proprietary ownership over the land and its resources. 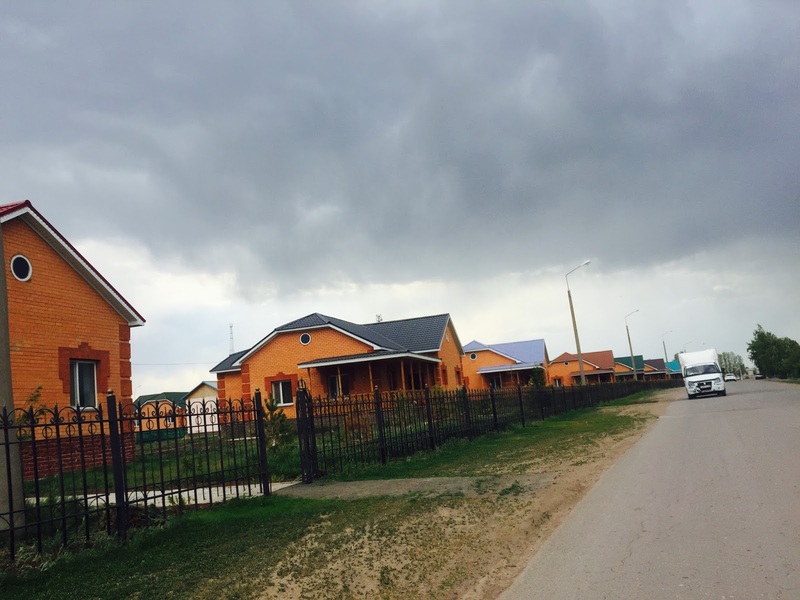 Traditional Kazakh mentality also impacts notions of private property. In the United States, an individual or an entity owns title over a specified area of land. This individual purchases the land at a market-determined rate, and depending on the zoning code, is entitled to develop the land how he/she sees fit. Individual ownership is legally codified in a written contract. 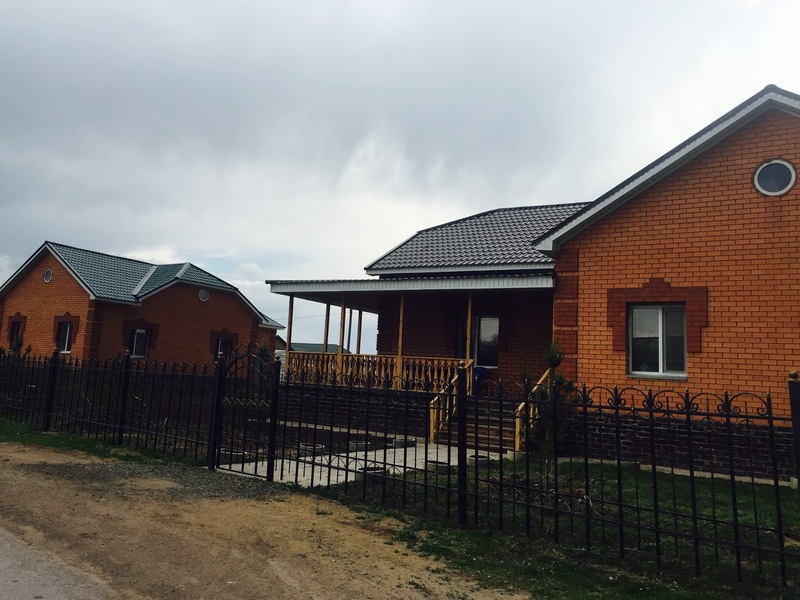 However, in Kazakhstan, a Western notion of private property ownership has not yet materialized due to a nascent institutional environment as well as the lingering impact of Soviet and Kazakh norms of land ownership. In traditional nomadic culture, each tribe or group of tribes controlled a given area. Tribal ownership over said territory was not formalized through written contracts, but was established through inter-tribal negotiations (or war) and was an understood, widely accepted norm. Each Kazakh tribe had a land they inhabited in the summer, and another land in the winter. This was collective ownership, not individual ownership. Plus, property was collectively owned by members of a tribe, as there was no individual who claimed title over an area. An adherence to tradition permeates other aspect of modern Kazakh society. Most Kazakhs memorize seven generations of their family trees, as it is forbidden to marry someone related to you within those seven generations. According to the tradition of Shildekhana, following the birth of a newborn, both the baby and mother stay home for forty days. At the end of this period, family members gather to celebrate the healthy mother and baby’s entry into the world. With respect to questions over state policy, Kazakh sensitivity to foreign activities on Kazakh land materialize in debates over reforms to the subsoil code and the terms on which foreign companies have access to subsurface resources – notably heavy and rare earth minerals, oil and gas. Kazakhstan has an extremely generous maternity leave policy, wherein mothers can be home with their children for up to three years (though they are only paid during the first year), all the while reserving the right to return to work. All women, even those who are unemployed or work informally devoid of a contract, are eligible for these benefits. At a press conference for members of the Russian press on the sidelines of the Astana Economic Forum, I asked Ali Abdikarimovich Bektayev, a current Nur-Otan member of the Mazhilis originally from South Kazakhstan Oblast, about the idea of “Atameken” and Kazakh resistance to foreign ownership of the land. I asked given widespread opposition to granting foreigners the right to purchase land, how does he foresee this mentality informing discussions on the terms of leasing land. Will the length of a lease for foreigners be extended to 25 years or remain at 10 years? 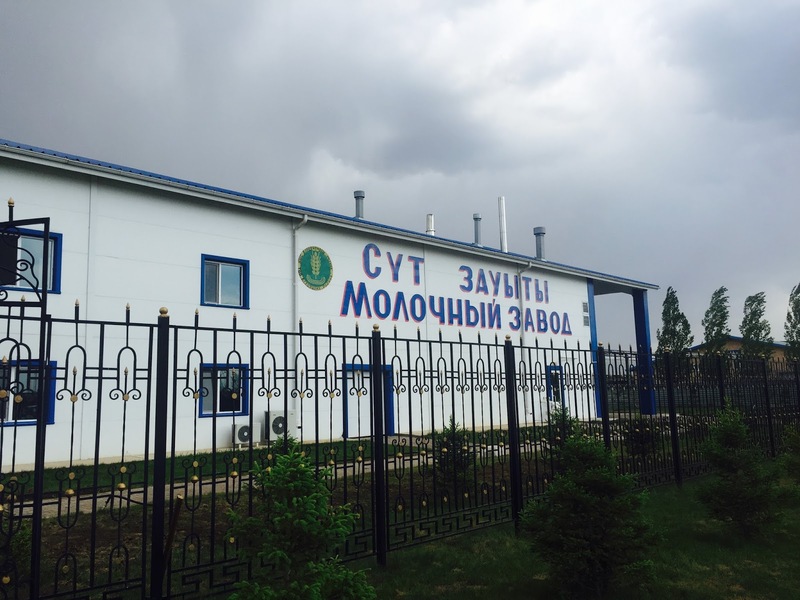 Bektayev pursed his lips, grew reticent for a moment, and affirmed that Kazakhs do in fact have a special relationship to land, and it is unlikely that Kazakhstan will permit foreigners to directly purchase land. But Bektayev was unable to answer my question with respect to the length of leases. Moreover, at the meeting of the Presidential Commission for Land Reform on Saturday, quoting Marx, one Commission member argued that private property should not exist in Kazakhstan at all. The idea of one individual owning a certain portion of land is ridiculous, as land is not a good (tovar), rather, it is a form of livelihood and the source of all other goods and being. The government should own all land in Kazakhstan, and individuals (including citizens of Kazakhstan) should only be permitted to rent land. Other members observed that if foreigners are allowed to lease land for up to 25 years, over the course of that period, a new generation of foreigners (Chinese were specifically cited) will live there, and the land will no longer be inhabited by Kazakhs, but by foreigners. Another delegate commented, Kazakhs fought so long for their land, why would they give that up? As an American, from a cultural perspective, I consider the long-term leasing of land to foreigners a positive development, as it encourages assimilation. 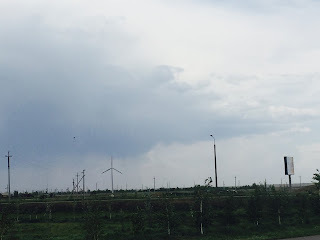 If a newcomer cultivates economic value and raises a family on Kazakhstan’s agricultural land, then this family will most likely become assimilated into Kazakhstani culture. Their children will attend school in Kazakhstan, forge friendships with locals, and speak Russian and Kazakh. While Kazakhstan does not necessarily require migration to sustain population growth given the high birth rates, certainly any high-value labor should be welcomed – especially in a country that has over 120 different nationalities. Younger businessmen on the Commission, such as Nurzhan Altayev from Atameken, and Bissetayev, possessed more liberal view towards land ownership, arguing that long-term leases were necessary to secure foreign direct investment. In China, leases for agricultural land are for 99 years. Ten years is simply not a sufficient amount of time for agriculture, where bank loans are made for at least 50 years, and payback period is usually in excess of 50 or 100 years. Plus, it makes no sense if a land lease is for ten years, but a lease on a tractor is for 50 or 100 years. Other individuals on the commission who were willing to grant foreigners the right to lease agricultural land advocated that leases should come with limitations with respect to visas for foreign workers, lease length and scope of activities. That said, nearly all members of the committee agreed that Kazakhstan will not permit foreigners to purchase land, echoing the sentiment expressed by protesters on May 21st. 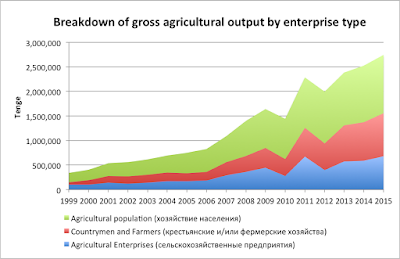 It is also worth noting that this is not the first time in recent history Kazakhstan has grappled with land reform. The introduction of Kazakhstan’s first land code in 2003 – marking the introduction of private property into the legal nomenclature – was so controversial that then- Prime Minister Imangali Tasmagambetov was forced to resign. Since then, attempts to amend the land code, especially in 2011 when the land code was modified to grant companies with over 50% foreigner ownership the right to rent land for 10 years, were met with protests. In short – traditional Kazakh notions of land ownership influences the debate on land reform today. Both political elites and ordinary Kazakhs feel this intimate relationship with land. In the future, Kazakhstan’s policymakers must reconcile historically cultivated, nomadic notions of land ownership with modern desires to attract foreign direct investment in a legal framework that is consistent with global business practices.